iTunes enables us to play and organize a large collection of digital music, music videos and video files on desktop computer. Usually, when we would like to play the iTunes library with iPhone or iPad, we have to sync it to the device. However, it costs us time and effort to sync and the video and music synchronized from iTunes will surely take up the storage space of iPhone iPad. Here is a nice way to save you from these entire troubles, namely streaming iTunes library to iPhone iPad with Air Playit. Air Playit consists of two components, Air Playit server and the client application. 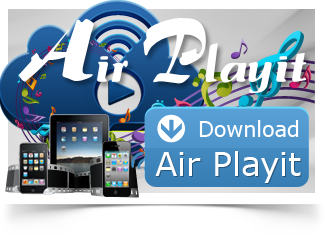 Air Playit server runs on your PC/Mac for you to share the iTunes playlist, set access permissions etc and client application works on iPhone iPad to get the streaming from the server. By streaming video and music from iTunes playlist with this free video streaming software, you can simply enjoy the following benefits. * You no longer need to sync the video and music because Air Playit is capable of streaming the file to iDevices wirelessly via WiFi, 3G or 4G network. * You can remotely access and play the iTunes library with your device while occupying no storage space in your device, since the files are stored on your PC/Mac. * Besides streaming video and streaming music from iTunes library, you are allowed to download them to your Apple device for playback when there is no network connection. Before you start streaming iTunes playlist to iPhone iPad, you should download Air Playit, install Air Playit server on your PC/Mac and Air Playit client app on your iPhone/iPad respectively. 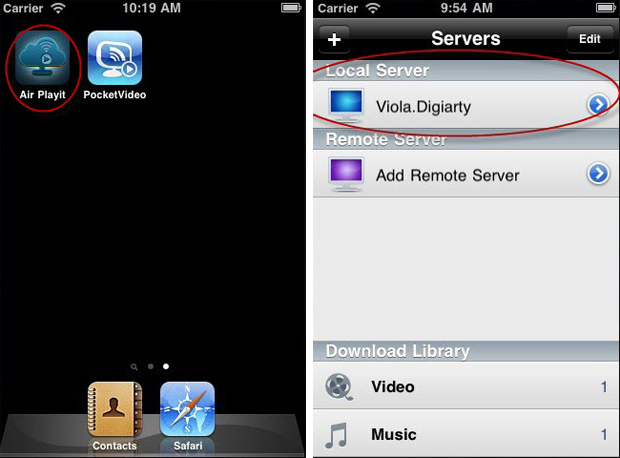 And then, add the video and music that you need to stream to iPhone or iPad from iTunes library to iTunes playlist. 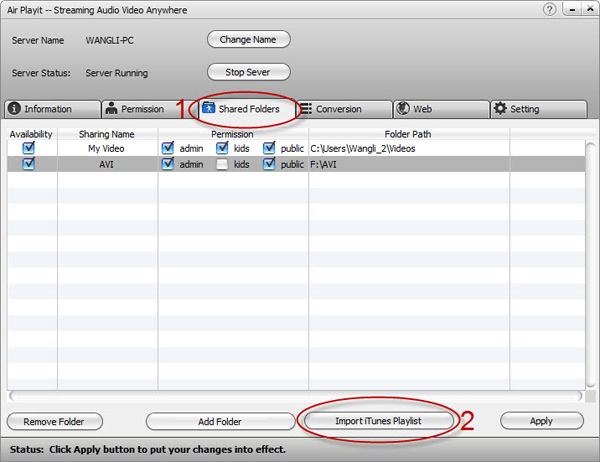 Step One: Run the server and import music or video from the iTunes library to share. Click "Shared folders", and then "Import iTunes Playlist", now the server is ready for streaming video and music to your iPhone iPad. Step Two: Run the client app, add your server and tap it. If sometimes the client app can't find the Bonjour connection information, you need to specify the server address manually or close the firewall for a try. Step Three: Browse the folders under the server and tap the video or music that you need, click "Play" to start streaming iTunes library to your iPhone iPad. *This free video streaming software works well in streaming the non-commercial video and music files which users added to iTunes library, yet it does not currently support streaming video and music purchased from iTunes Store which are DRM protected. 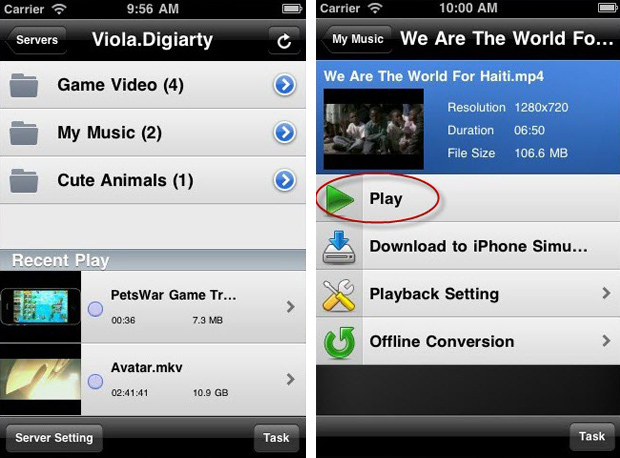 *Air Playit enables users to download videos to iPhone iPad. Click "Download to iPad", or "Download to iPhone" and Air Playit can start streaming the video and audio from iTunes playlist and download them to your device.